.The Hangover… it’s not just the title to one of my favorite movies of all time, it’s every drinkers worst nightmare. And after a long night of drinking, networking and socializing it’s the last thing you want to wake up with in the morning. For those of us that drink on the regular, we’ve heard it all and tried it all when looking for cures to a hangover. Eat more, drink water, rest, avoid mixing types of alcohol, avoid cheaper alcohols etc. The problem is most of us know what things to do AFTER a hangover has already crept up rather then what to do to PREVENT it. Or even worse, we feed into myths rather than facts on how to cure it. As a proud member of the “I’ve only had one hangover EVER” club, I make it a point to take as many precautions to avoid getting a hangover as possible. That being said when I heard of a product out there using all natural ingredients that you could drink before going to bed BEFORE the hangover sets in, I just knew I had to try it. Last Round Hangover Support comes to you from Herbasway, the fine makers of several liquid dietary supplements and features a combination of all natural herbal extracts such as Kudzu, Stevia, green tea, and licorice. While most of us are familiar with licorice, green tea, and the stevia(sugar) plant, it’s the lessor known Kudzu that’s the star of this how. It’s claim to fame is being able to reduce cravings for alcohol. ….. 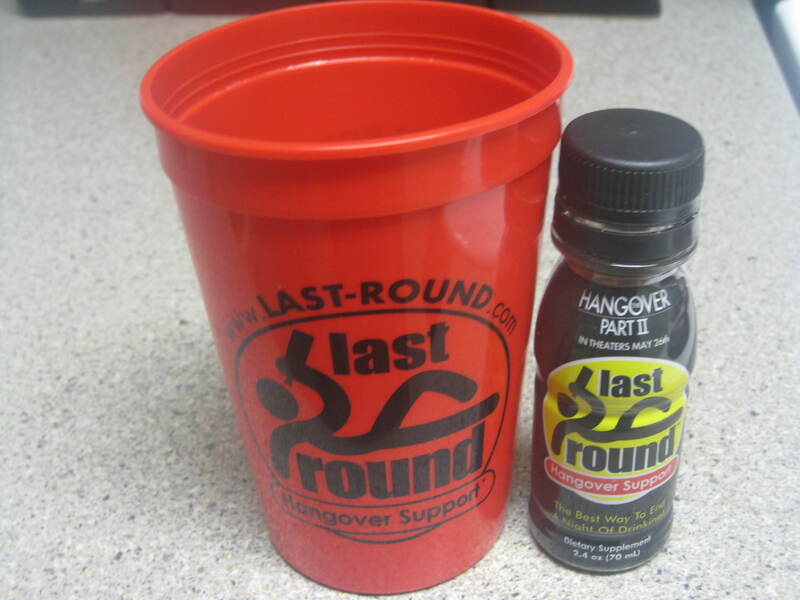 I was lucky enough to receive a goodies package from the fine folks over at Last Round complete with a drinking cup, some beer pong balls and a cool poster (Thanks Guys! ), but the toughest part was finding a good night to give it a try. As fate should have it, a drinking festival hit my town last weekend where myself and the Mrs. were able to finally let loose. 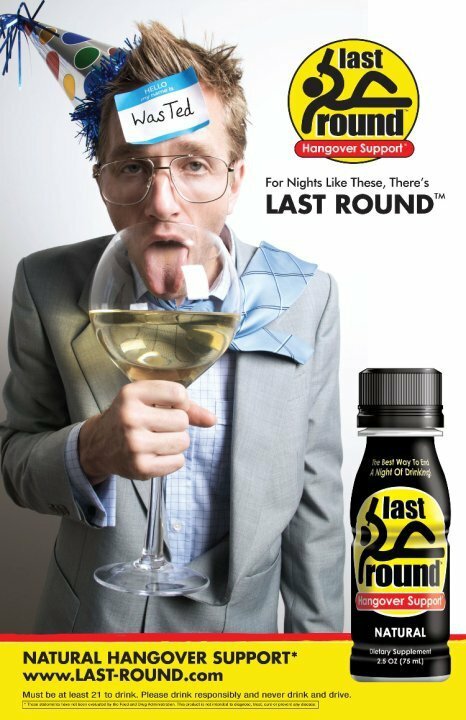 One of the biggest worries I had when preparing myself to down the 2.4 oz bottle of liquid “get out of jail free card” was that it would either A) have a horrible taste, B) have a horrible odor, or C) All of the above. To my surprise it featured a sweet/sugary odor and a taste that resembled green tea which for me was a plus. So what’s the verdict; After a night of drinking about 6 to 8 (strong) margaritas and 3 or 4 tequila shots, with very little to eat, I woke up feeling about as good as if I had just slept 10 hours on a bed of feathers. I felt rested, and saw no lingering affects of a night of careless drinking. Success ! …..If you’re still not convinced, unable to get a hold of a bottle, or flat out just don’t want to give it a try, you can always check out my post on other Hangover Remedies to help you next time you’re out. As always don’t forget to tell your friends about us and “Like” us on Facebook. Till next time, class dismissed.